Are you ready to explore how the benefits of creativity could help recharge you from the drain of your busy lifestyle? I am taking advantage of this time while my arm is in plaster to make a positive effort to reflect and recharge, and what has occurred to me is, how lucky I am to be able to live my life engaging in my passion for creating every single day. Creativity has enriched my life in so many ways, so I would like to share some of my ideas, inspiration and experiences in the hope that you might be encouraged to take a step towards awakening your own creative spirit within. The power that creativity in any form has on reviving and recharging us in our day to day hectic lifestyles is invaluable and embracing it could open the door to exciting and relaxing new experiences. Barriers like making time, knowing how, where to look or just giving yourself permission to do so often hold us back. Join me on Wednesday 20th Feb 7-9pm at Verdigris Studio, 304 Broadway, Stratford for a cuppa and chat. 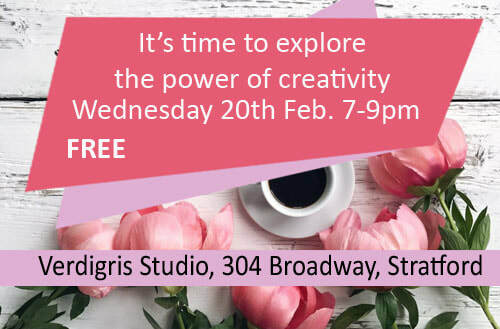 This is a free event so come along and see if we can share some insights and point you in the right direction to find and explore your own inner creative. Anyone is welcome but bookings are essential as we only have space for 20. Call or text Sue on 0274284243 or fill in the enrollment below to secure your space. This is not a selling event but merely a sharing of knowledge and information that should help inspire you.